Buy the Therm-O-Type FT-10 foil fuser online for a high quality, but economical, foil fusing machine. It is compatible with our 24 x 500' foil rolls featuring 1" cores, once they are cut down to 12 ½" maximum widths. the FT-10 fuser will quickly and efficiently foil wedding invitations, business cards and more. 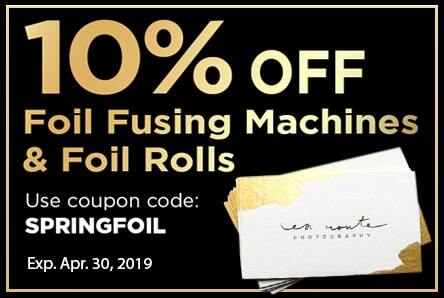 It features adjustable speed and heat controls to help you obtain the perfect foiled paper for even many difficult-to-foil applications. ① Make sure all switches are "off" and plug in your machine. Attach the in-feed tray. ② Set the speed and temperature and wait for it to warm up. A good starting point is 20% speed and 80% temperature. ③ Install your roll onto the foil shaft firmly with the opening facing down and toward the machine (away from you), and place the shaft back into place. ④ Pull about 15" of foil away from your roll and use thick card stock to push the foil through the feed opening. ⑤ Wrap the foil onto the rewind shaft and bars on the exit tray (watch video to the left). ⑥ Turn on the "forward" switch and lower the impression lever, allowing the foil to "track" through the fuser a few inches, then raise the impression lever until the foil stops. ⑦ Center a test page with the side guide and run it through the machine. Check for quality and adjust the heat and speed settings if necessary. ① If the tips of your design are missing foil, then settings are either too slow or too hot. ② If there is incomplete foil in solid areas, then settings are either too fast or too cold. The FT-10 Foil Fuser is an affordable, hand-fed, high quality machine designed for small runs of foil fusing jobs. FT-10 features include 12.5" wide maximum paper width, manual impression control, foil unwind and rewind tension adjustment, electronic speed and temperature range controls. This foil fuser makes it easy to add brilliance to invitations, award certificates, business cards, letterhead and more. Using our foil fusing equipment and supplies, flat foil jobs can be produced without the need to purchase a foil stamping die or expensive foil stamping equipment. No special makeready supplies or skills are required to produce beautiful foil stamping. The FT10 Foil Fuser from Therm-O-Type offers a simple, fast, affordable, and professional way to apply foil to toner- printed designs. Here’s how easy it is to setup and use the FT10. First, attach the infeed tray to the front of the machine. Now make sure the power switch on the back, and the toggle switch on top, are both set to “off”. Lift the impression lever into the “off” position. Attach the power cord to the back of the FT10, and plug it in to the power source. Then turn on the main power switch on the back. As a starting point, set the speed dial to 20% and the temperature dial to 80% (right between medium and high). Allow about 15 minutes for the machine to warm up and for the ready light to turn on. To load your foil roll, loosen the hubs on the foil shaft with a screwdriver and remove it. Pull off one of the hubs and place your foil roll onto the shaft. Your foil needs to have a 1” core and be a maximum of 12 ½" wide. I will link to compatible foils and a foil roll cutter below. Orient the foil so that the foil pulls from the top and is facing the machine, and place the hub back onto the shaft. Place the shaft back into the FT10 and make sure the hub blades are engaged with the foil roll and the roll is positioned properly side-to-side. Now tighten the hubs with a screw driver – do not over tighten them. Now pull about 15” of the foil away from the roll. Use a piece of sturdy cardstock to push the foil through the fuser. Now move to the back of the machine. Make sure the foil is underneath the “stripper roller” at the bottom. Loosen and remove the clamping bar. Now wind the foil under and around the stripper roller, then under and over the blue rewind roller. Put the clamping bar back in place on the rewinder, and twist the assembly toward you until the foil is tight. From the front of the machine, move the toggle switch to “forward” to begin spinning the foil roll and finish the tightening process. Now lower the impression lever. Allow the foil a moment to “track” through the machine for a moment, then raise the impression lever again. This should stop the foil from rotating. If the foil keeps moving, increase the tension on the opposite side of the lever until it stops. Once the foil stops rotating with the lever raised, you are ready to start. Place your pre-printed paper onto the feed table and align your paper guide according to the size and foil location. The compatible foil is a toner/heat reactive foil, so remember that your print must have been printed with a dry toner (not a wax based ink). You also want to be sure that you are using a smooth paper stock, as textured will not work as well. Before beginning your job, run a test sheet through to test for quality. Press the lever down and insert your page to begin foiling. If the tips of your design are missing foil, or if foil is adhering to parts of the page that have no toner, even after wiping the page, then it is too hot – lower the temperature or increase the speed, and test again. If you experience an incomplete foil transfer to solid areas, then it is too cold – raise the temperature or decrease the speed, and test again. Continue small adjustments and tests until you are happy with the result, then run your job. Note that thinner paper will require less heat to foil, while thicker paper, like cardstock, will require more. In this video, we are running an 80 lb. smooth cardstock. To remove the waste foil, cut the foil from the back and remove the rewind shaft. Remove the clamping bar from the shaft, and slide off the foil. In this short foiling video, you can see the Therm-O-Type FT-10 Foil Tech Foil Fusing Machine add gold metallic foil to a sheet of 8.5" x 11" paper in real-time.